Exploring the rivers of Georgia is an exciting idea. All of our rivers end up in an ocean. Our largest river is the Altamaha River, which is a combination of the Oconee River and the Ocmulgee River as it joins in South Georgia. 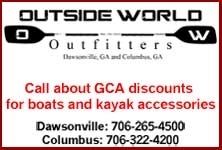 The 2011 paddle in March 25-27, 2011 will start on the Altamaha River and end up on the Atlantic Ocean. Good news! I think we have a winner on a paddle trip. Danny Grissett from Altamaha Coastal Tours suggests that to meet the criteria you’d like the most closely, that we start the trip at Altamaha Fish Camp Landing — a nice park with all facilities, and paddle from there to Darien the first day (no immediate camp sites in Darien but there are B&B’s and we’d be getting out in “town,” which is very small and quaint, with regular hotels also down the road, and this is where Altamaha Coastal Tours’ office is located. Then on day two we could paddle in the coastal area/creeks, in river kayaks, though, for as long or short a time as was wanted. The first leg is about 17 miles, which is a good way, but if we paddle with outgoing tide, it’s easy and quicker than you’d think — about 5 hours, Danny said. On April 1-3,2011, Darien, Ga will celebrate the festival for the “Blessing of the Fleet”. Some of GCA members plan on staying on from the March 25th paddle, camping and paddling islands, including Cumberland, Sapelo, during the week and enjoying the celebration in Darien on April 1-3.